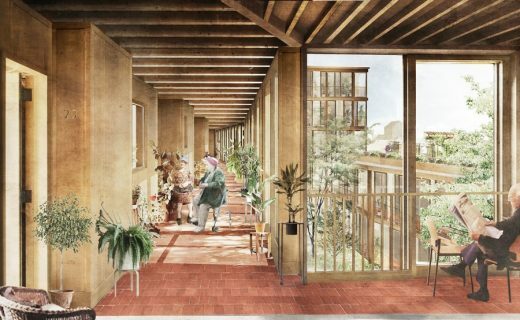 Witherford Watson Mann Architects has secured planning permission for an almshouse that sets a new benchmark for the design of housing for the older generation. 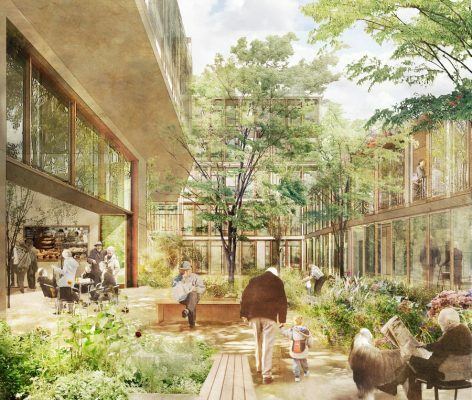 Designed for United St Saviour’s Charity, the 6,152 sqm almshouse will be located in Bermondsey, Southwark on the site of a vacant, post-war nursing home. The extra-care development will provide independent living accommodation for around 90 older people along with 200m2 of ancillary communal and public rooms. Witherford Watson Mann Architects’ design re-invents the almshouse typology to create a distinctively urban development that maximises its position on the local high street. The 2013 Stirling Prize-winning practice collaborated on the project with writer Ken Worpole to develop the innovative social character of the almshouse, which is conceived as both communally cohesive yet open to the local community. The building rises to five storeys and is concave in form along Southwark Park Road to create a more inviting entrance. Generous communal areas including a community lounge are arranged along this main elevation in two-storey glazed bays. These will be highly visible from the street and will be available for use by community groups. The almshouse is organised around a central garden court. This functions as the unifying focus of the building, with all residents approaching their apartments along a generous glazed walkway that opens onto the central residents’ garden. The dual aspect community lounge and a cafe also open up entirely to this garden space. The garden court is bounded by a two storey rear wing where the building steps down to meet the scale of the terraced housing on the side streets. Roof gardens on these lower volumes provide raised planting beds and outdoor rooms. The durable, highly crafted elevations are detailed to reflect the characteristics of the surrounding Victorian terraces. They form a strong presence on the street with a combination of textured, purple-brown brick, precast concrete lintels and cills, and timberframed windows. Terracotta tiling is used to clad the set-back fifth storey and the gables to the side streets. Residential accommodation comprises 51 one-bed apartments of 50-64m², and six 2-bed apartments of 78-82m². As well as the community lounge and café, ground floor communal facilities include a private residents’ lounge and a multi-use craft room. Laundry, bathing/therapy room, hairdressing salon, and meeting spaces are situated on the first floor. 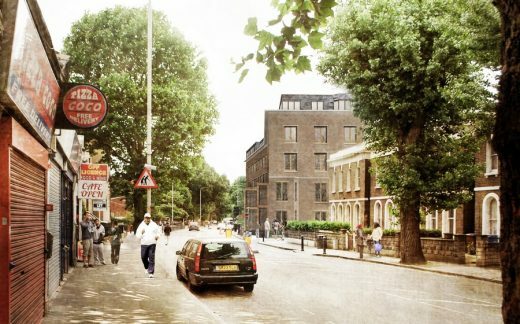 The Charity’s CEO, Martyn Craddock says “we are really excited to be part of making a Southwark a great borough to grow old in and we are already searching for our next almshouse opportunity.” The Bermondsey development will provide the long-established charity with a third almshouse. Its first was established in Southwark in 1584 (and subsequently relocated to Putney) with a second built in Bankside in 1752.